Gills Indian Cuisine uses their own specialised couriers to deliver their food. Chopped onions with Indian spices mixed in chickpea flour and deep fried. Delicious mixed vegetable wrapped in light pastry, deep fried and served with mint and yogurt dip. Mixed vegetables dipped in chickpea flour with Indian spices and deep fried. Cottage cheese filled with mint dipped in chickpea flour with Indian spices and deep fried. Cubes of cottage cheese and vegetables marinated in yogurt with Indian spices and cooked in tandoor. Selections of samosa, onion bhaji, mixed pakora and paneer pakora. Cottage cheese marinated in plain flour and cooked with capsicum, onion, soy and chilli sauce. Chicken with bone marinated in yogurt with Indian spices and cooked in tandoor. Boneless chicken pieces marinated in yogurt with Indian spices and cooked in tandoor. Lamb mince mixed with Indian spices and wrapped in light pastry and deep fried. Minced lamb marinated in garlic and ginger paste with Indian spices and cooked in tandoor. Boneless chicken pieces marinated in yogurt with Indian spices, garlic and cheese and cooked in tandoor. Boneless chicken pieces marinated in thick cream, cheese, cashew nut paste and cooked in tandoor. Prawns marinated in yogurt with Indian spices and cooked in tandoor. Boneless chicken marinated in plain flour and cooked with capsicum, onion, soy and chilli sauce. Delicious fried fish dipped in chickpea flour mixed with Indian spices and ginger-garlic paste and deep fried. Chicken tikka, tandoori prawn, lamb seekh kebab and garlic chicken tikka. Prawns marinated in plain flour and cooked with capsicum, onion, soy and chilli sauce. Please note all our Curries contain nuts and cream. Some Curries are available Dairy Free and Gluten Free. Boneless chicken cooked with chef's special gravy in North Indian style. A popular dish made with tomato, cashew nut gravy, butter and cream. Boneless chicken pieces cooked in thick tomato, onion and capsicum gravy. Chicken Tikka cooked with onion, tomato, capsicum, Indian spices and butter cream. Boneless chicken pieces and potatoes cooked with Indian spices and herbs. Boneless chicken cooked with herbs and spices in cashew nut gravy. Boneless chicken coked in vindaloo gravy with Indian spices. Boneless chicken cooked in spinach gravy with Indian spices. Boneless chicken cooked with vegetables and Indian spices in onion and tomato gravy. Boneless chicken cooked in traditional Indian style. Boneless chicken cooked with Indian spices in onion, tomato and coconut gravy. Boneless chicken pieces cooked with Indian spices and mango pulp. Boneless chicken pieces cooked in coriander, onion and tomato gravy. Boneless chicken cooked with yellow lentils and Indian spices. Boneless chicken cooked in Indian spices with yogurt, mustard seeds and curry leaves. Beef cooked with chef's special gravy in North Indian style. Beef cooked with Indian spices, onion, tomato and capsicum. Beef cooked with Indian spices, herbs, and cashew nut gravy. Beef cooked in spinach gravy with Indian spices. Cubes of beef and potatoes cooked with Indian spices and herbs. Beef cooked in vindaloo gravy with Indian spices. Beef cooked with Indian spices in onion, tomato and coconut gravy. Beef pieces cooked in thick tomato, onion and capsicum gravy. Beef cubes cooked in traditional Indian style. Beef pieces cooked with coriander, onion and tomato gravy. Beef cooked with vegetables and Indian spices in onion and tomato gravy. Beef cooked with yellow lentils and Indian spices. Lamb cooked with chef's special gravy in North Indian style. Lamb cooked in vindaloo gravy with Indian spices. 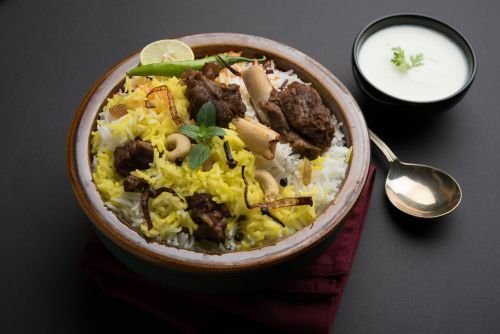 Lamb cooked with Indian spices and herbs in cashew nut gravy. Lamb cooked with Indian spices, onion, tomato and capsicum. Cubes of lamb and potatoes cooked with Indian spices and herbs. Lamb cooked in spinach gravy with Indian spices. Lamb pieces cooked in coriander, onion and tomato gravy. Lamb pieces cooked in thick tomato, onion and capsicum gravy. Lamb cubes cooked in traditional Indian style. Lamb cooked with vegetables with Indian spices in onion and tomato gravy. Lamb cooked with Indian spices in onion, tomato and coconut gravy. Lamb cooked with yellow lentils and Indian spices. Goat cooked with chef's special gravy in North Indian style. Goat cooked in vindaloo gravy with Indian spices. Goat cooked with Indian spices and herbs in cashew nut gravy. Goat cooked with Indian spices, onion, tomato and capsicum. Cubes of goat and potatoes cooked with Indian spices and herbs. Goat cooked in spinach gravy with Indian spices. Goat pieces cooked in coriander, onion and tomato gravy. Goat pieces cooked in thick tomato, onion and capsicum gravy. Goat cubes cooked in traditional Indian style. Goat cooked with vegetables and Indian spices in onion and tomato gravy. Goat cooked with Indian spices in onion, tomato and coconut gravy. Goat cooked with yellow lentils and Indian spices. Prawns, fish, calamari and mussels cooked with Chef special gravy in North Indian style. Prawns cooked in spinach, onion gravy with spices. Prawns or fish cooked with chef's special gravy in North Indian style. Cubes of prawns or fish and potatoes cooked with Indian spices and herbs. Pieces of prawns or fish cooked in thick tomato, onion and capsicum gravy. Pieces of prawns or fish cooked with Indian spices, onion, tomato and capsicum. Prawns or fish cooked with Indian spices and herbs in cashew nut gravy. Prawns or fish cooked with Indian spices in onion, tomato and coconut gravy. Prawns or fish cooked in vindaloo gravy with Indian spices. Boiled black lentils and kidney beans cooked with Indian spices, butter and cream. Mixed vegetables cooked with onion, tomato and capsicum. Cottage cheese, butter and cream cooked with Indian spices and herbs. Cottage cheese cooked with Indian spices in fenugreek gravy. Mixed vegetables cooked with Indian spices and spinach gravy. Spinach and cheese cooked with Indian spices. Potato and cauliflower cooked with onions and Indian spices. Green vegetables cooked with Indian spices and herbs in cashew nut gravy. Potatoes cooked with cumin seeds and Indian spices. Round balls of cottage cheese and potatoes cooked with Indian spices in cashew nut gravy. Cheese cooked with Indian spices in thick tomato, onion and capsicum gravy. Fresh green vegetables cooked with Indian spices. Yellow lentils cooked with Indian spices in North Indian style. Fresh spinach and potato cooked with Indian spices. Mix vegetables cooked with yellow lentils and Indian spices. Green vegetables cooked with Indian spices in onion and tomato gravy. Cottage cubes cooked in butter gravy and cream with Indian spices. Four beans and fresh vegetables cooked in onion and tomato sauce with Indian spices. All naan breads are made with plain flour, eggs, milk and canola oil. A combination of garlic, cheese and butter naan. Raita cucumber, mixed pickles and mango chutney.